Deputies of all parliamentary caucuses have backed a proposal by State Duma Speaker Sergey Naryshkin to cut their recently increased salaries as part of the Russian government’s budget optimization. “I asked all four State Duma factions to discuss the possibility of a salary reduction for parliamentarians. The issue is in the competence of the head of the state, but if parliamentary parties support my suggestion we will forward it to the president,” Naryshkin told the lower house of parliament on Tuesday. The Duma speaker explained that the move would be in line with the optimization of all state budgets, including the means needed for the functioning of the State Duma. 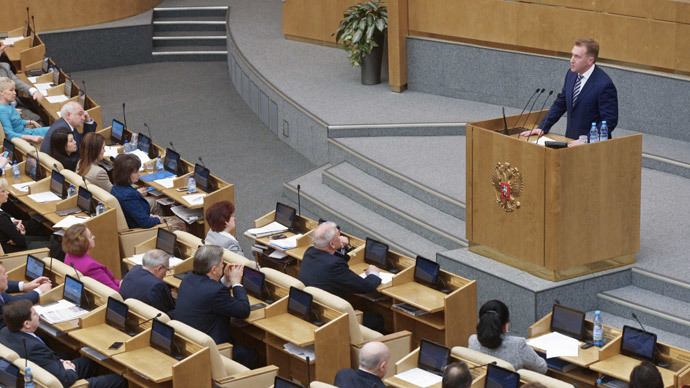 The State Duma speaker proposed that his colleagues consider a 10 percent cut in their wages. Representatives of all parliamentary parties supported Naryshkin’s suggestion in published comments. The head of the majority faction United Russia, Vladimir Vasiliev, called the initiative “a good impulse,” but noted that giving up a part of their salary for MPs must be a strictly voluntary thing and therefore it needed a detailed discussion with each and every parliamentarian. The deputy head of United Russia’s parliamentary caucus, Frants Klintsevich, added that the wage cuts must be discussed as part of a wider budget optimization. He also said that his faction had already warned against reducing the salaries of State Duma staff who were getting the least, while doing the bulk of work. Populist nationalist party LDPR supported the move and expressed a readiness to increase the pay cut. MP Igor Lebedev told the RBC news agency that the 10 percent reduction was a done deal, and that lawmakers would simply be informed about it. “We understand that 10 percent would not save our country from the economic crisis. We are ready to continue slashing our salaries. If the speaker tells us to cut it by 30 or 35 percent, we’re ready,” Lebedev said. The deputy head of the Communist Party caucus, Ivan Melnikov, told reporters that although his comrades had not discussed the initiative in detail, he was sure that it would find unanimous support because they wanted to suggest such a move themselves. “In unstable and difficult times, the State Duma must breathe through the same lungs with the rest of the nation, without using any oxygen masks. What cut will we undertake? I think we must find a variant that would not be purely cosmetic and yet remain reasonable,” Melnikov said. However, all lawmakers acknowledged that their consent would not be enough for the move, as according to Russian law the salaries of parliamentarians are calculated on the same scale as salaries of federal ministers. The government has not yet expressed its attitude to Naryshkin’s suggestion. The monthly salary of a State Duma MP in Russia is currently 420,000 rubles or $6,700 at current rates. Lawmakers also have the right to a quarterly bonus of 81,500 rubles or about $1,300. The law forbids the MPs to receive any other income while holding their parliamentary posts, with the exception of artistic or educational fees.